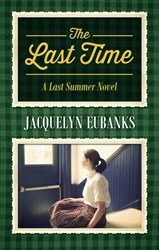 Award Winning, Best-Selling novelist, Jacquelyn Eubanks, releases The Last Time. The Last Time is the second novel in The Last Summer Series. This sixteen year old novelist wrote the first draft for The Last Summer when she was only 12 years old. The Last Summer, her first novel, quickly became a best seller and was selected as a Finalist in 2012 USA Book News Awards. It is predicted that The Last Time will have even greater success than the author's first novel. The Last Time takes place in 1955, and Charlotte “Charley” Mason has just moved to New York, leaving behind her hometown in Georgia, her group of baseball-playing best friends, and her boyfriend, Frankie. The Last Time is an engaging novel about a girl who faces universal high school challenges with grace and courage. "It is exciting to see how Charley has grown by the challenges she faces," comments Jacquelyn Eubanks about the novels main character. "I wish I was more like her at times. She is so courageous." Charley comes to realize the importance of faith, family and friendship.